And you can have it all INSTANTLY on your desktop, phone, or tablet. that will give you the insider secrets to transform from a good speaker ...to one that Owns The Stage ...overnight! Ever notice how some seemingly gifted speakers make it look so easy? How do they do that? What if you could? Most speakers take the stage, but they don’t own it. They don’t keep their audiences on the edge of their seats, leaning on their every word. They don’t energize their audiences and keep them wanting more. And, they don’t leave them with a message that sticks. IT’S NOT A GIFT THEY’RE BORN WITH. THEY LEARNED IT SOMEWHERE. Here’s our guarantee to you: By the time you complete this entire program, you will have the tools needed to Own The Stage yourself. When you put these tools to work, you’ll become the kind of speaker people will travel far & wide to see. How would you like the PROCESS for creating more of them? That’s what you’ll get with the Own The Stage program ...the best PROCESS in existence. This is the same process that helped one company raise 17 million dollars. A CEO from another organization requires that his presenters learn this process in order to advance to the next level in his company. These presenters are selling $150,000 in contracts each month. You can get this same process that these successful people are using. Great question! Most of my programs were developed as a result of my experience as a speaker. I only started coaching my first speaker back in 1999, after winning the World Championship of Public Speaking. Now, I have a whole new perspective — I help transform other presenters. I’ve helped celebrity athletes, CEOs, and I even coached other Champs before they won the World Championships. In the past few years, I’ve learned many new techniques from my own coaches — and I’m just dying to tell you about them! I’ve also teamed up with fellow World Champion, Darren LaCroix. Our combined 14 years of coaching experience, along with his perspective on storytelling, will transform your speaking. ​Who are Craig Valentine and Darren LaCroix? ​...and we couldn’t answer it! Throughout the years, many people have asked us to recommend a tool for learning the “Use of the Stage.” At one of our Boot Camps, we heard the question again, and we finally looked at each other and said, “Guess it’s time for us to create one!” And, the idea was born. It originally started out as a 2-DVD set. We hired a film crew and traveled to Toronto, Canada to film. DVD #1 was supposed to be the “Principles,” and DVD #2 was to be “Coaching Tips.” Then, at the Boot Camp, we decided to film the whole two days to make sure we captured the most transformational moments for each of the participants. After listening to the feedback we received from people who were there that weekend, we knew we just couldn’t leave anything out! It was truly amazing to watch eight speakers — of varying experience levels — transform and apply our Own The Stage Foundations. The participants loved it! And so... we kept it all! We were so serious about making this an incredible and helpful tool, that we busted the budget, blew off the original timeframe, and invested a year of our lives (along with $25,000) to make this a program you’ll refer back to for years to come. Each time you watch Own The Stage, we GUARANTEE that you’ll see new ideas for your own presentations — ideas that you didn’t catch the first time, or the second, or the third...! THIS PROCESS WAS SO INTENSE... AND THE TECHNIQUES SO ADVANCED... THAT WE'LL PROBABLY NEVER DO THIS AGAIN. We know of no other program that reveals the actual LIVE coaching you’ll see in the Own The Stage program. So, come class with us, sit in the 3rd row, and watch Darren and me coach eight speakers to “own the stage.” Just a quick warning... one of our observers took more than 23 pages of notes! So get on the edge of your seat, take out your notepad, loosen up your writing hand, and get ready to Own The Stage! 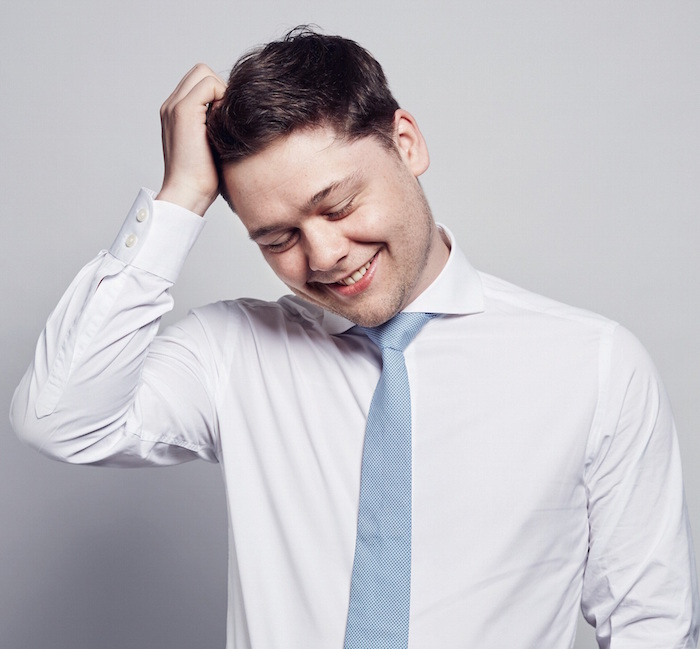 Why learn “bad habits” when you’re just starting out as a speaker? Those habits could take years to overcome. If you start early — and use the right tools & techniques — you will surpass many of the speakers around you. They’ll want to know your secret! Carmelita, one of the speakers you’ll see on Own The Stage, wrote her speech the night before the Boot Camp. She was an average speaker with very little experience when she walked in. And she walked out completely transformed... She owned the stage. “But what if I’m an experienced presenter who is already confident on stage? Even better! As a professional you know most paid speeches come as a result of someone who has seen you present live. So, the better you are “live,” the more referrals you can get, and the faster you can raise your fee. Bottom line, the best speakers get coached. Here is a perfect way to get the same insights without spending thousands of dollars. You could. But even after being a comedian for more than ten years — and a speaker for twelve — Darren has learned new strategies and transformed his own speaking in the past two years. He learned them from his own coached. You’ll get these insights instantly and without any effort from the Own The Stage program. But why not take the learning of 15 years from two speakers and infuse it into your own style? Give us ten hours, and we’ll take ten years off your learning curve. Guaranteed. There’s more advice out there on speaking than there are good speakers. Whose advice will you follow? Weeding through bad information can be a huge drain on you, and it’ll slow your own growth down. Learning from someone who is only one step ahead of you will also slow you down and limit your growth. Does that make sense? 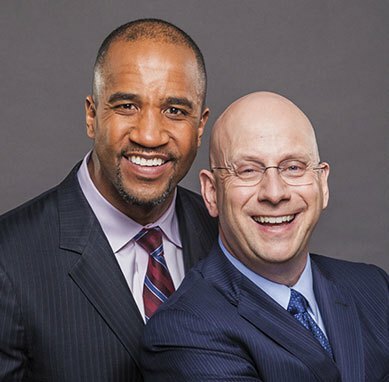 When Darren & I both went for the championships, we got advice from hundreds of speakers. But when we went to the previous World Champions, we got the exact opposite advice from what everybody else gave us! What works in the real world is usually counter-intuitive. The problem with trying to do it on your own is that you don’t know what you don’t know. Are you willing to risk ten years of experimenting, when you can have the best advice in your hands by next week? And, you don’t even have to leave your home or rent a hotel room to get it! Witness 8 speakers transform …overnight! What “coaching” did Darren and I give them? How did they apply it? In the Own The Stage program, you’ll see a variety of presenters... like Pat, a Financial Advisor, who transforms into a powerful communicator overnight... to a new presenter like Carmelita, who had written her speech the night before, and transformed that brand new speech into a powerhouse personal story. You’ll see participants take their seven-minute speeches from lackluster to blockbuster... “signature stories” and keynote presentations that come alive before your eyes... a business presentation that shows bottom line results from a very personal story. The overnight transformation of these speeches is truly amazing! Some programs are informational, some educational... we’ve created one that is truly transformational! It’s one thing to be a great speaker, but it’s entirely different to be a great presentation coach. After a combined 24 years of speaking, and 14 years of coaching presenters just like you — this is what we do. 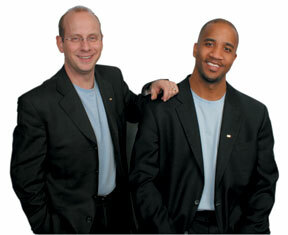 Darren and I have transformed speakers who have achieved remarkable results. Speech contest participants — here and worldwide — have so many success stories. We’ve worked with celebrity speakers, to millionaire CEOs, to people who are just starting out. All have learned our process, and they now apply that process to every new presentation they create. I traveled 17 hours to go to this Boot Camp, and it was worth every hour. The investment was returned triple fold. The knowledge you get from this camp, you can’t put a price on it." Good? It is crucial! For Darren and myself, 80% of our paid speeches come as a direct result of someone seeing us speak. Why? Because when we speak, we “Own The Stage. “Who is this program designed for?" It’s simple. The Own The Stage program is designed for serious students of speaking and presenting... at any level. At our Boot Camps, and in private coaching, we’ve worked with All-Star Celebrities, beginning speakers, and everyone in between. It doesn’t matter what level you’re at. What matters is that you’re serious about getting the highest level of education possible, and that you’re committed to your audience. Transform your speaking with 10 Videos, Guide to Greatness, and Own The Stage 49-Point Coaching Checklist! Join Darren & me for a live seminar and learn to design your speech and deliver it with power! Get inside our minds as we prepare for our professional presentations... a week before, an hour before, and 5 minutes before. You’ll get our techniques for using slide shows (while still Owning The Stage). We’ll cover details of how to open a presentation, along with the importance of matching the energy level of the audience. There are 30 “Own The Stage Foundations” on these two DVDs. You’ll learn how to breathe life into your characters, along with a crucial part of storytelling: showing the change of emotions in your characters as your stories progress. You’ll see how narration becomes dialogue, which uses half words, half the time, and is twice as powerful. There’s so much “meat-per-minute” in this DVD, that you may have to take a break before you move on to the next one! # 3 – Applying the Own The Stage Tools - See our coaching and the difference it makes! # 10 ~ Coaching Kitty — See a speaker with a disability that was originally given bad advice from speakers around her, take a personal story and create a bottom line business message, with huge laughs! Join Darren and me for our full 2-day Coaching Boot Camp, where you’ll watch 8 speakers give speeches and receive the World Champion-level feedback you can use to become the best speaker in your neck of the woods! This is crucial. We didn’t have enough room on the 10 DVDs to fit everything we wanted to cover. So, pay close attention to the Guide to Greatness, where you’ll find additional thoughts & notes that we added in later. You’ll also find diagrams that are essential to your complete understanding of the Own The Stage mind set. 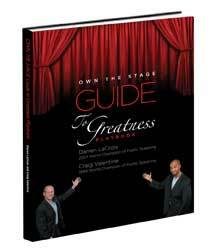 The Guide to Greatness is specifically designed to reinforce what you will learn when watching the DVDs. You’ll write down key concepts & ideas, which, in the writing becomes more a part of your thinking. In this guide, you’ll also use the Own The Stage 49-Point Coaching Checklist as you coach the other speakers right along with us. Wait... the Own The Stage 49-Point Coaching Checklist? What’s that? The value on this is priceless! Craig and I have been coaching for a combined 14 years. Even a year ago (when we shot these videos), we only had 29 points to look for when coaching speakers. We’ve added 20 points in the past year! This checklist combines years of perspective onto one form. It’s the most up-to-date coaching form we use ourselves when coaching top executive and fellow speakers at our Boot Camps. This took years to develop, and we’ve included it as part of this program for you. More than 49 “Own The Stage” Secrets Finally Exposed! Quickly and succinctly research your audience, the way Darren and I do! Cost? We hear this all the time! Well, what is your time worth? We’ve never had anyone attend the Get Coached to Speak Boot Camp and ask for their investment back. And, all of the attendees have had two travel days, paid for a hotel room and plane ticket! You can get the same insights from Darren and me... without ever leaving your home! An average executive speaker coach can cost between $1500 to $5000 per day. Own The Stage won’t even cost you half that! Maybe you’re looking to go professional... no problem. Just pop in the DVDs and you’ll instantly access to our lifetime of speaking secrets. It’s almost as if we’re there coaching you on a one-on-one basis. Just by applying these amazing secrets, if you get $500 for your first speaking gig, this course has paid for itself. What if you get $1,000 or $2,000 per speaking gig? How great would that be? Or maybe you’re a salesperson... imagine that instead of selling one-on-one, you can now leverage your time and sell one-to-10, or one-to-100. With this program, the more people you’re in front of, the more the effects of this wisdom will be multiplied. You can easily double or triple your income overnight! Let’s say bare minimum... just a few $500 speeches, and it pays for itself. One promotion, and it pays for itself. One more client, and it pays for itself. One more sale, and it pays for itself. We are also going to give you an 11 Audio CD Set as a FREE bonus worth $195! Why? Advanced presentation coaching must be viewed, that is why we have it on DVD. To truly internalize all of this wisdom, we want you to be able to listen over and over again in your car or while you work-out. The true path to mastery is repetition! How about a 77 Day “No Worries!” Guarantee? If after you watch the first 3 DVDs, you don't get the full value, please send it back! I want you to be happy whether you keep it or whether you don’t. Why 77 days? I want you to take your time and make sure you are delighted and everything I say is 100% true. Don’t give another presentation without these techniques. Period. Transform your own speaking along side eight others. By the time you complete this program, you won’t be the same speaker who started it! You will learn to Own The Stage!